The Network step of the wizard is only available if you have chosen to perform advanced failback. If you plan to fail back to VMs in a new location (for example, another site with a different set of networks), you can map DR site networks to production site networks. Veeam Backup & Replication will use the network mapping table to update configuration files of VMs on the fly, during the failback process. Select one or more VMs in the list and click Network. If a VM is connected to multiple networks, expand the VM, select the network to map and click Network. The Select Network section displays all networks to which the target host or cluster is connected. 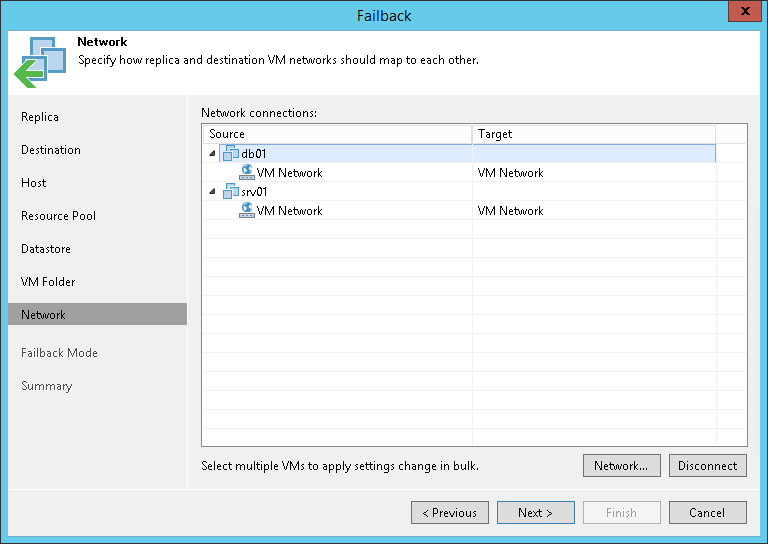 From the list of available networks, choose a network to which the original VMs should have access upon failback. To facilitate selection, use the search field at the bottom of the window: enter a network name or a part of it and click the Start search button on the right or press [ENTER]. To prevent the original VM from accessing any network upon failback, select the VM or its network connections in the list and click Disconnected.